Our organization is engaged in offering a wide range of Industrial Aprons. These Industrial Aprons are designed using leather, asbestos and cotton, which are procured from the reliable vendors of the market. Our offered aprons ensure protection to the wearer from hazardous work process of factory and can also be used in industrial lab application. 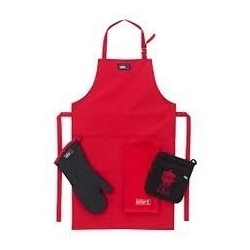 The offered aprons can also be customized as per the requirements of our clients. Looking for Industrial Aprons ?